For Louisiana Richardson, desperate times call for crazy-like-a-fox measures. 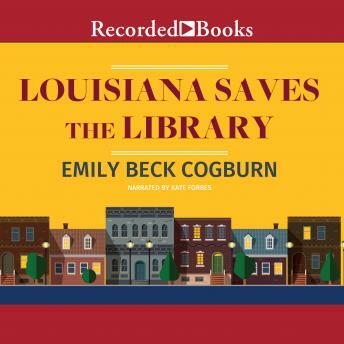 As the new librarian at Alligator Bayou Parish's struggling library, she's returning to her Southern roots and facing trouble hotter than fresh cornbread out of the oven. Somehow, she's got to draw readers back in and prove the library is still vital--even as domineering parish board head Mrs. Gunderson plans to shut it down for good. If that means Louise has to resort to some unconventional methods--like outrageous inter-library Zumba classes, and forming a book club that's anything but Oprah-approved--well, it wouldn't be the first time she went out on a limb. . . Soon Louise is doing everything she can to rally the whole community. Before she knows it, she's sparking welcome changes--and uncovering surprising secrets--throughout her new town. And between glasses of sweet tea, bowls of mouth-watering gumbo and the warmth of a tantalizing new love, the newly single Southern mom might find a life she never imagined--and a place to finally call home. Emily Beck Cogburn crafts a novel full of charm, delight and acres of heart about the enduring joys of storytelling and the ways hope can write life's most extraordinary moments.